Majorca is the largest island of the archipelago of the Balearic Islands. It is one of the best destinations for cycling. Its climate, its extensive network of secondary roads with very little traffic and excellent views, the combination of sea and mountain, plain and spectacular ports makes it a paradise for cyclists. 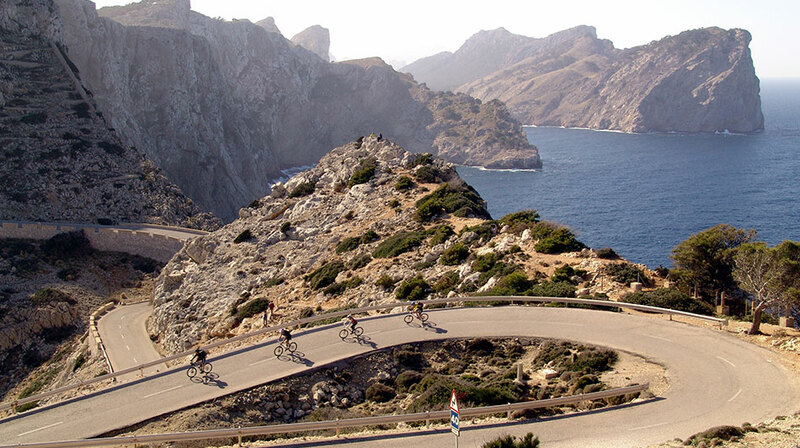 Due to all these advantages, Majorca has become the main cycling destination in Europe. For the same reason every year more and more cyclists come to the island ranging from professional cyclists there to train to the leisure cyclist on holiday. Majorca offers good opportunities for cyclists of different abilities and all this in a fantastic setting, creating a perfect place to ride. When is the best time for cycling in Majorca? The cycling season starts in February and is most active until May. It is when the maximum temperatures vary from 17 to 22° C. July and August are the hottest months, so they are not the best for training. 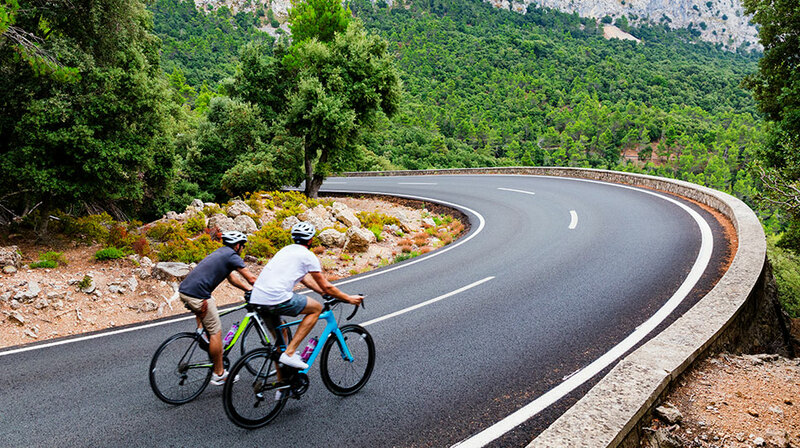 From September to November the temperatures are mild, pleasant and predictable again (between 23-19 ° C) to return to enjoy the island in your cycling holiday in Majorca. December, January and February are colder, although temperatures are around 15° C.
Majorca has a road network of 1,250 km, of which 675 km are secondary roads with an average width of 6. 5 m. This excellent network of secondary roads offers varied itineraries with limited traffic, something that is positively reflected in the cyclist’s safety. This is perhaps the main advantage as the island, due to its length, allows both short routes where you can visit several villages (the average distance between villages is only 10-15 km) and longer routes (150-200 km) extending to any point of the Majorcan geography. There are totally flat routes with spirals and slopes and even high mountain areas such as the Serra de Tramuntana range. The range of routes, due to the type of difficulty, is very wide. Among all the routes you can enjoy both coastal routes, with breathtaking scenery and hidden coves with turquoise waters or test your endurance on the challenging mountain trails. 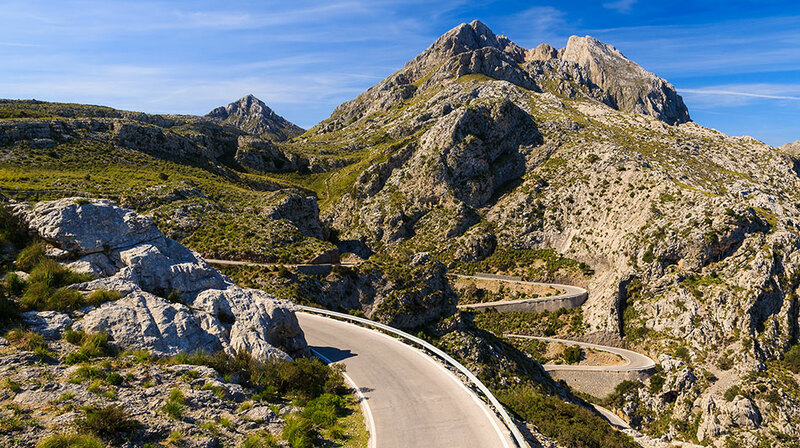 We have compiled TOP 3 of the recommended routes for professional cyclists, including the legendary Sa Calobra route, as well as for those looking for a simple diversity in spending their holidays cycling in Majorca. Sa Calobra is probably the most famous cycling route on the island of about 9. 5 km long with an average gradient of 7% and some significantly steep curves. It is the narrow spirals, one on top of the other sliding gracefully through the valley that makes this route so unique and demanding at the same time. The route to Cap de Formentor is considered a route for the days of recovery, but also one of the most beautiful ones. It has a distance of about 60 km from Alcudia and even less from Pollensa. 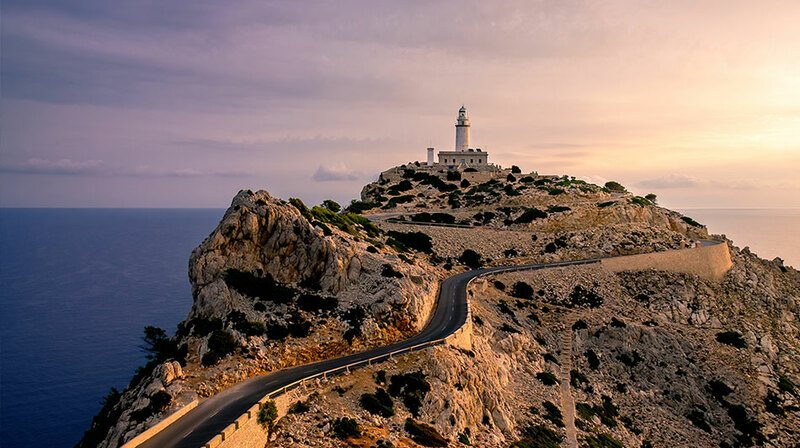 Nevertheless, it is necessary to consider that it is a route that counts on a rise of approximately 3,7 km, followed by a gradual descent and ascent to the lighthouse of Formentor. Although the route is not one of the easiest, the incredible views make it a route not to be missed during cycling holidays in Majorca. A 13. 7 km route with 6% grade average starting from Soller. A route definitely recommended although it is not one of the easiest routes. Long and a little painful stretches are rewarded with breathtaking views that can be appreciated from the highest point of the Sierra de Tramuntana. ➡️ Majorca 312 sportive: One of the biggest and most popular cycling events of the year. Organized since 2010, it takes place in April, every year. It attracts thousands of cyclists from all over the world who take over the island for 312 or 167 km. More information here. ➡️ IronMan 70.3: A triathlon event that takes place in May, in Alcudia. Composed of the 1. 9 km swimming course in the city’s harbour, 90 km of a challenging bicycle route between hills and flat stretches and at the end a 21 km road on the picturesque Alcudia beach. You can find more information here. One of the great advantages of Majorca is its size. Any point on the island is easily accessible from all over the area. However, we must recognize that there are areas especially valued by cyclists and one of them is the north of the island, with its coastal cities Pollensa or Alcudia. The main attraction of this area is its proximity to the edge of the Tramuntana mountain range. It is from here where you can easily access the routes of Puig Major, the highest point on the island or the famous curved route of Sa Calobra. However, the area also promises for its flat roads along the coast, as for some routes through the countryside or even historical tours for example in Alcudia where you can explore the walls of the fourteenth century or a picturesque route through the Roman bridge in Pollensa. At Sealand Villas we have villas adapted to the needs of cyclists in the perfect areas to enjoy cycling in Majorca, but also close to cities, cultural areas, restaurants and bars with services for cyclists. Why choose a Cycling Friendly villa accommodation over a hotel? ▪️ Complete flexibility - come and go as you like without the restrictions of restaurant times etc. ▪️ Non-peak rental prices are easily comparable to the hotel prices and even better! Especially if you consider that the car hire is already included in the price. ▪️ Your villa is a perfectly equipped home with full laundry and drying facilities for washing. ▪️ With a complete bike station with safety hangers for your bike, professional cycling tools, personalized routes and all kinds of cycling services at your disposal. ▪️ And finally... after a day in the saddle what better way to relax and soothe those aching joints than to jump in your own private pool!